Blonde Gone Clean was a part of me for over three and a half years – three and a half years of low lows and high highs. It was with me through the stressors of my last three years of college, through the excitement of my second and third half marathon and first full, through the endless days studying for my personal training certification and the seemingly endless days of my ulcerative colitis hospitalization, through travels across the world, through breakups, through getting my first full-time job (which I promptly quit), through navigating the adult world for the first time, through losing myself and finally discovering myself again. But even when you discover yourself and feel fully you, you’re never truly done growing, changing and finding new aspects of yourself. Blonde Gone Clean changed my life and it will always be a part of my identity, but once I started planning a relaunch of my business with a new website, services and courses, I realized the name no longer resonated with me. I had outgrown Blonde Gone Clean and felt pulled to find a name that felt like me to my core. I realized Blonde Gone Clean held too much of an emphasis on clean eating, when my wellness philosophy encompasses so much more. I, as a holistic wellness coach and wellness guru, encompass so much more. And YOU encompass so much more. My clients encompass so much more. Yes, I believe wellness is fully impacted by the ways we choose to nourish our bodies, but it also is fully impacted by the love we give ourselves, the stress we allow in our lives, the thoughts in our mind, the way we move our bodies and the happiness we feel in our daily lives. Wellness is about realizing you are more than enough in a society that constantly tells you to strive for more, better, skinnier. Wellness is sitting with uncomfortable thoughts in order to change them and fix your relationship with food, exercise and your body. Wellness is learning to say “no” to people and things that don’t serve you. Wellness is protecting your energy, vibe and alone time. Wellness is realizing self-love is rooted in every day action and self-care is not reserved for special occasions. Wellness is actually quite messy in my opinion and my wellness journey has always lacked clean lines. It’s been a hell of a road and I’m thankful for every single bump along the way because it helped me grow in confidence, resiliency and self-love. I’m at a place now where wellness is intuitive and I truly, honestly, 100% can say I feel like I’m living my best life. My most well life. And that makes me really damn happy. Will I continue to fall down? Of course, but I’ll get right back up. Will I continue to work towards big goals with a fire lit inside of me? There’s no doubt about it because there is always space to grow. Will I continue showing up for each and every one of you every single day? Oh sister, you have my word – OF. COURSE. New name, but same nat. Same positivity, same realness, same yummy eats, same goofiness, same self-love preaching from the rooftops. But with a little new-new and with a little more, because change is good. Change is scary, but good. So let me reintroduce myself - hi, I’m nat and I am plenty and well. Why plenty and well? Because my goal is to inspire women realize that they are plenty while striving to live well. To break free from the idea that in order to be well they must have and be more. Of course, sister, I’m going to be pushing you, supporting you and cheering LOUD for you (pom poms not optional) throughout your wellness journey. I’ll say, “I see those big goals girlfriend; now let’s go CRUSH them.” I won’t let you settle for anything less than your best, well life that you are worthy and capable of living. But even when you have goals to reach and the space and desire to grow and change, I want this space to be a reminder that you’re still plenty, you’re still enough, even in the midst of your own messy wellness journeys. To remind you to love yourself so damn hard even when you don’t feel like you haven’t quite mastered this whole wellness, happiness, inspired living thing. Whether you’ve known me as Blonde Gone Clean since the start or if you’re brand new here and Plenty and Well is all you will ever know – welcome. And please, make yourself at home. This corner of the internet, of the wellness world, of my brain put down into words, is a space for YOU. 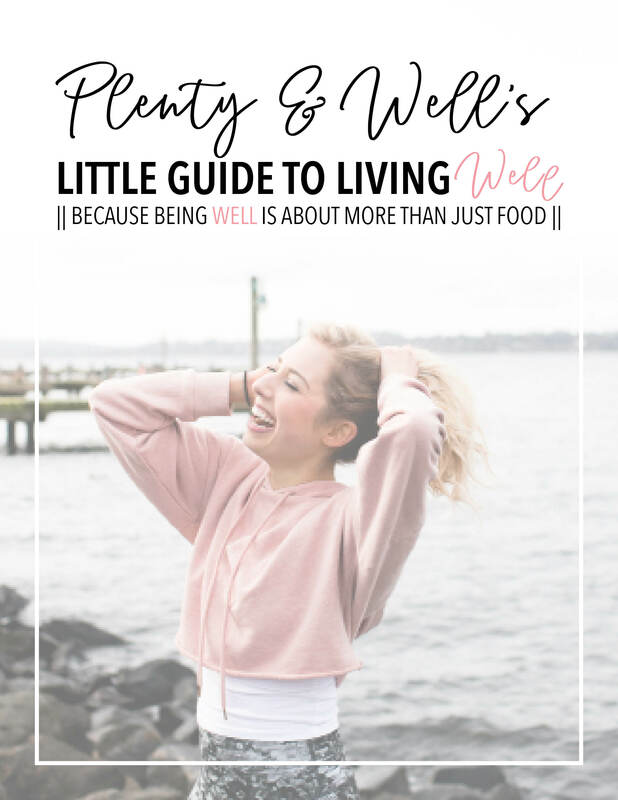 It’s a space for positivity, motivation, wellness tips & tricks, drool-worthy eats for health-nuts and non-health-nuts alike and a whole lot of self-love. It’s a space to remind you that you are plenty. And it’s a space to help you live well, be well and feel well. Welcome to this new chapter in my own journey sweet friends. It’s going to be good, I can just feel it.